Standard 8 Axis Motion controller – Enabling up to 8 stepper driven axes to be controlled. DCM Motion controller – a special controller version incorporating a Servo motor driver for Bragg Axis control. This unit can also control up to 6 stepper driven axes. All Axes use Phytron ZMX+ plug-in microstepper motor drivers which are factory fitted. Phytron ZMX+ drive cards are used for bipolar control of two-phase stepper motors and utilise 4 quadrant chopper type current control circuitry. Ideally suited to in-vacuum motors they are also suitable for the Nema range of in-air stepper motors amongst many other types. All operating parameters – run current, step resolution and preferential direction can be set by rotary switches or by a Service bus mode depending on the type of ZMX+ fitted. Reference: Phytron ZMX+ Data Sheet 2111-A008GB . For Servo driven axes an intelligent PWM driver designed to drive brushed and brushless servo motors is utilised. This fully digital drive operates in torque, velocity, or position mode and employs Space Vector Modulation (SVM), which results in higher bus voltage utilization and reduced heat dissipation. The MCS-8 Plus Motion Controller has evolved from the success of its predecessor the original MCS-8 product which has been in use in the Synchrotron Industry since 2005. Designed and manufactured by FMB Oxford this new motion controller will again compliment our extensive range of Beamline system components used for Synchrotron radiation experiments. The varied requirements of these systems have resulted in a new controller design that is highly flexible that can perform intricate control functions to solve even the most complex positioning problems. Built around the Delta Tau Turbo PMAC 2 / PC104 architecture, this unit combines power supplies, drive amplifiers and an optional embedded controller in a single 4U 19” rack mount module. The Delta Tau PMAC incorporates a full PLC specifically designed for positioning and control functions and this provides extensive facilities for configuring the eight axes separately. Additionally, complex programmes can be downloaded into the PLC for high resolution control of motors. 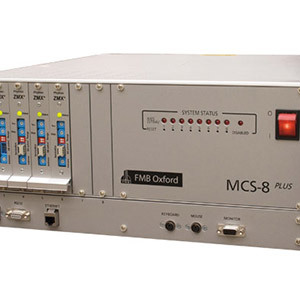 The PMAC 2 is housed on a motherboard assembly designed specifically for FMB Oxford by Delta Tau and this provides the connectivity to the driver amplifiers, encoders and limit switches. Several new features include the introduction of a front loaded Drive card system housing from a single drive card amplifier up to eight depending on the system requirements. A motor ‘Emergency Stop’ disable function has also been added to aid commissioning of connected equipment. The MCS8+ has been independently tested for compliance; it is CE marked and CB certified as part of the IECEE CB scheme. The design of the system allows each unit to be configured to suit a specific customer’s requirements with regard to control and system integration. FMB Oxford have nearly two decades of experience in synchrotron beamline technology and, in addition to the hardware, they can provide technical expertise in solving even the most complex positioning problems. Digital I/O 8 digital inputs and 8 digital outputs are available on a 25 way ‘D; type connector. These are opto-isolated and can be configured for “sink” or “source” operation. Programming connection Both standard USB and conventional RS232 connectors supplied. These are used for configuring and programming the Delta Tau controller. Network 10/100 Base-T Ethernet connection on RJ45 connector. Encoder input 15 way ‘D’ type connector with A & B quadrature encoder inputs and C index channels compatible with encoders that have differential or single-ended drivers. Switch input 9 way ‘D’ type connector with connections for home position switch and two position limit switches. Drive Type Configurable up to 8 x Phytron ZMX+ Micro Stepping Drivers. Step resolution p to 1/512 depending on driver type. AC Input 100 V to 240 V ±10%, 1ph, Inrush protection provided. Size 483 mm (W) x 177 mm (H) x 520 mm (D) 4U, 19” rack mount case. This is an optional embedded controller fitted on systems where an EPICS based SBC (Single Board Computer) is required. Description Embedded PC104 single card PC with Geode 500 MHz processor & 256 MB RAM. Main storage – 1GB compact flash card.. Connections Standard video connection, PS2 mouse and keyboard. A 10/100 base-T Ethernet connection on RJ45 connector replaces the direct connection to the Turbo PMAC2 card.